Then the whole group stood up and led Jesus to Pilate. They began to accuse Jesus. They told Pilate, "We caught this man trying to change the thinking of our people. He says we should not pay taxes to Caesar. He calls himself the Christ, a king." Pilate asked Jesus, "Are you the king of the Jews?" Jesus answered, "Yes, that is right." Pilate said to the leading priests and the people, "I find nothing wrong with this man." The charges that the enemies of Jesus present are all lies. Pilate sees through these lies and goes to the crucial question: is Jesus King of the Jews? Jesus acknowledges that he is. Pilate pronounces him not guilty. 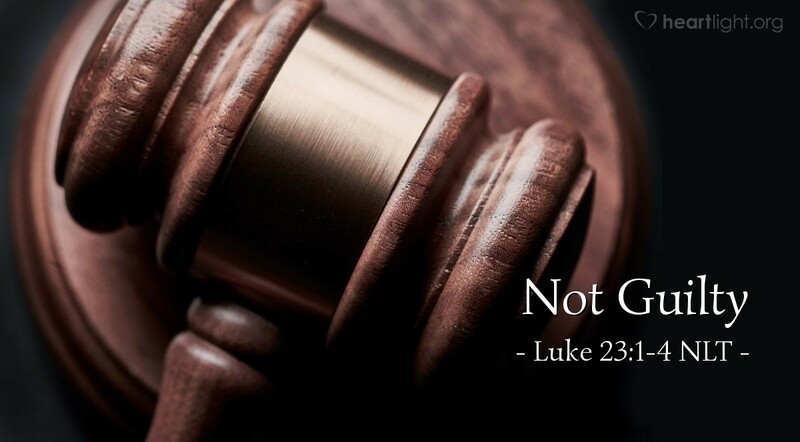 In fact, in the Gospel of Luke and in his companion volume, the book of Acts, Romans officials are repeatedly looking on Jesus and his disciples with favor. Unfortunately, however, political expediency often wins out over truth—as it does here with Pilate. Finding nothing wrong with Jesus, even recognizing him as an important teacher or a righteous leader is not enough. Do we believe he is the Son of God, our Savior and Lord? Are we willing to base our lives on his death, burial, and resurrection by confessing him and sharing with him in his saving work through baptism? Do we believe that he can transform us totally by pouring his Holy Spirit into our hearts and working his will in our lives? Jesus must be far more than a good guy and a great teacher. He must be our Lord! If he is not, then we will simply put him into the most convenient place in our lives rather than letting him totally transform us. Holy and righteous Father, please do your work in my life. I believe that Jesus, your Son, is the Messiah, my Savior and my Lord. I fully trust that he lived on earth as a human like me and that he gave up his life on the cross, that he was buried, and that you raised him from the dead. Please conform me to his character through the Holy Spirit who is at work in me. In Jesus' name. Amen.